Love it or hate it, creeping charlie is one tough plant. We'll introduce you to this common lawn plant, its uses and benefits, and if need be, how to get rid of it. 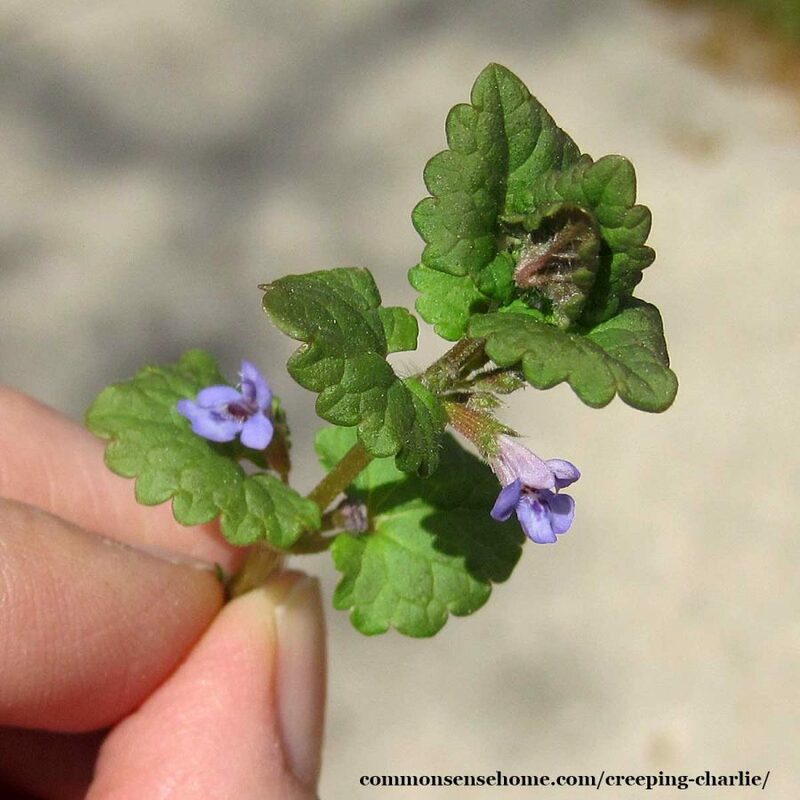 Creeping Charlie is also known as ground ivy, Alehoof, Catsfoot, creeping jenny, gill-over-the-ground, haymaids, field balm, run-away-robin and tunhoof. Glechoma hederacea is not the same as henbit (Lamium amplexicaule) or Purple Deadnettle (Lamium purpureum L.), AKA red deadnettle, red henbit. Read more about purple dead nettle and henbit. Creeping Charlie is native to Europe and southwest Asia. European settlers brought it to North America for medicinal and culinary use. It grows throughout most of North America, except for the far northern reaches of Canada and Nevada, New Mexico and Arizona. 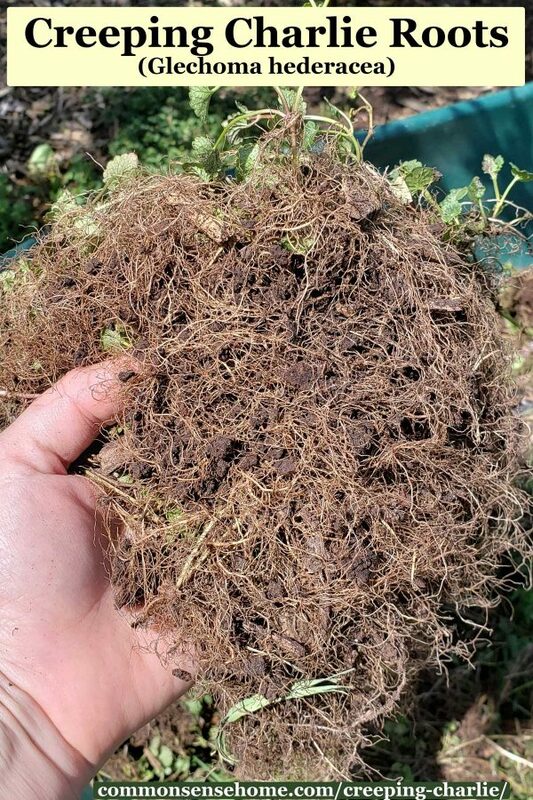 Ground ivy prefers rich, moist soils in partial to full shade, and readily volunteers in lawns, gardens, along roadsides and in other shady spots. As a member of the mint family, creeping charlie may be invasive. It's listed as a noxious weed in many areas. It prefers moist, shady areas where it may be difficult for grass to grow, making it a useful ground cover. Creeping Charlie always reminds me of my grandmother Catherine, who had dense mats of this plant growing in shady parts of her lawn. Every time I smell it I smile, because it makes me think of grandma. Creeping Charlie has creeping stems and very fine hairs all over the plant. The plant spreads by seed and rooting at the nodes, forming a dense mesh of vegetation. It has dark green, kidney shaped leaves with scalloped edges. The leaves are small – about the size of a thumbnail – and appear in pairs along the stem. Young leaves may have a purple tint. Light purple, funnel shaped flowers appear from spring into early summer. They form at the leaf axils. The foliage has a strong, spicy odor when damaged. The plant is a perennial broadleaf weed, blooming in the spring/summer and dying back in fall/winter. It may become dormant in hot weather. Ground ivy will readily regrow from small pieces left in the soil. The best control method is hand pulling the plant intact (if possible) while it is flowering. You can also control creeping charlie by smothering it under heavy mulch, or solarize it with black plastic. What about vinegar and borax? Enough borax to kill creeping charlie may also make the soil sterile for everything else. Not cool. The same goes for vinegar. Will goats eat creeping charlie? Despite their popularity for weed control, goats probably won't eat creeping charlie unless they have no other options. Too much may make them sick. Short answer – not in small amounts. 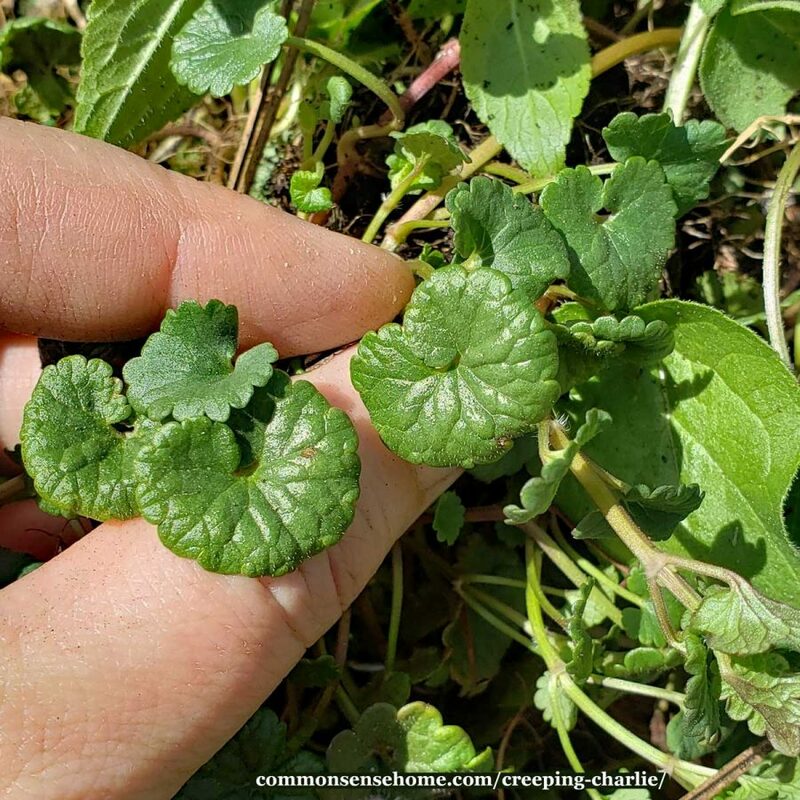 Ground ivy should not be used if you have liver or kidney trouble, are epileptic, or if you are nursing or pregnant, because it contains very small amounts of pulegone. Its high amounts of vitamin C may also interact with blood thinning drugs, such as Warfarin. 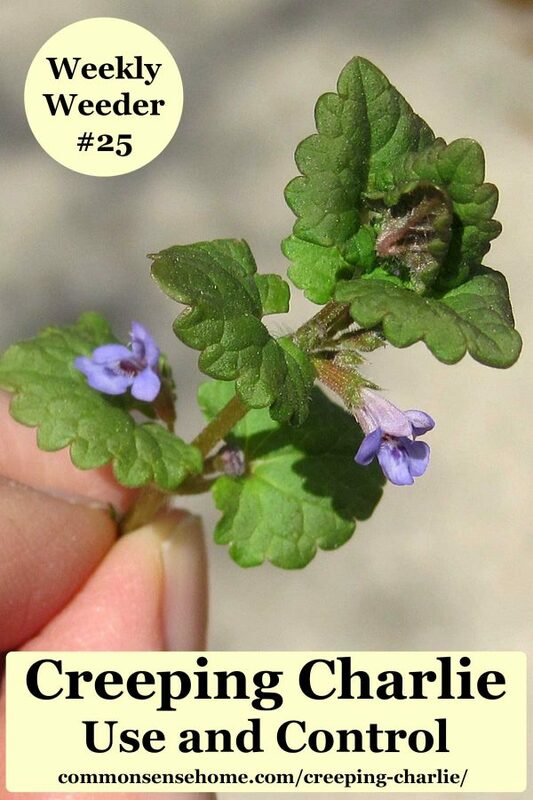 See Ground Ivy (Glechoma Hederacea) Dosing And Safety for more information. What is Creeping Charlie good for? As mentioned above, ground ivy makes a good ground cover where grass doesn't like to grow, preventing erosion. The tiny flowers also attract pollinators. The nectar of the flowers attracts long-tongued bees primarily, including honeybees, bumblebees, mason bees, a cuckoo bee, a long-horned bee, an Anthophorine bee, and small carpenter bees. Occasionally, the flowers attract green metallic bees, bee flies, a Syrphid fly, Sulfur and White butterflies, and skippers. The caterpillars of a polyphagous moth feed on the foliage of Ground Ivy, while the larvae of Ground Ivy Gall Wasp form galls on the stems, petioles, or leaves. Glechoma hederacea also has a long history of use for food and medicine – with some precautions, as noted above. The Weed Cookbook suggest steeping fresh or dried leaves in hot water for 10 minutes to make a tea. Add honey and a splash of lemon, if desired. It's good for coughs and colds. Edible Wild Food says the leaves are high in vitamin C, and suggests the young leaves be eaten in salad or cooked like spinach. The flavor is fairly strong, sort of citrus/pepper mix, so sample before you commit to larger quantities. Creeping charlie can be used as a rennet substitute in the same way as nettles, but it wouldn't be my first choice because of the distinctive flavor. In beer making, it replaces hops, to clarify the beer and improve storage life. Creeping charlie has a long history of medicinal use. The Holistic Herbal recommends it for sinus problems, coughs and bronchitis, tinnitus, diarrhea, hemorrhoids and cystitis. Its actions are listed as, “Anti-catarrhal, astringent, expectorant, diuretic, vulnerary and stimulant”. Studies indicate it is also strongly antibacterial. Ground ivy has a strong connection with the powers of magic and divination. Considered a safeguard against sorcery it was worn by milkmaids when first milking cows in the pastures. A magic charm, it was used to prevent the cows from enchantment. In many regions the first milking of the cows was actually done through a wreath of ground ivy. Other magical uses of ground ivy included promoting sleep, meditation, healing, love, friendship and fidelity. The ritual use of ground ivy was popular and the herb was often woven into crowns and garlands to be worn on Midsummer’s Eve. Note, this post is for informational purposes only, and is not intended to diagnose or treat a specific illness. Always exercise caution when using any wild plants and make sure you have positively identified the plant. This post is #25 in the Weekly Weeder series, which is devoted to helping you use and manage wild plants. Please Like, Pin, Stumble or otherwise share this post if you enjoy learning about wild plants. It only takes a moment and I really appreciate your help. Thank you for this! I’m beginning to nurture an interest in wildcrafting and am loving learning new information! Thank you for this! I think this is what we’ve had in our yard for the last 19 years (came with the house), and it has really spread this year! Aww thanks for the mention. Thanks for hosting this great linky party. Keep up the great work. Now I’m not sure if we have this plant or purple dead nettle. Oh, what I would do to have a wild-crafter come and tell me what everything is on this plot of land! Dead nettle has pointed leaves and stands upright. Ground ivy crawls across the ground with rounded leaves. 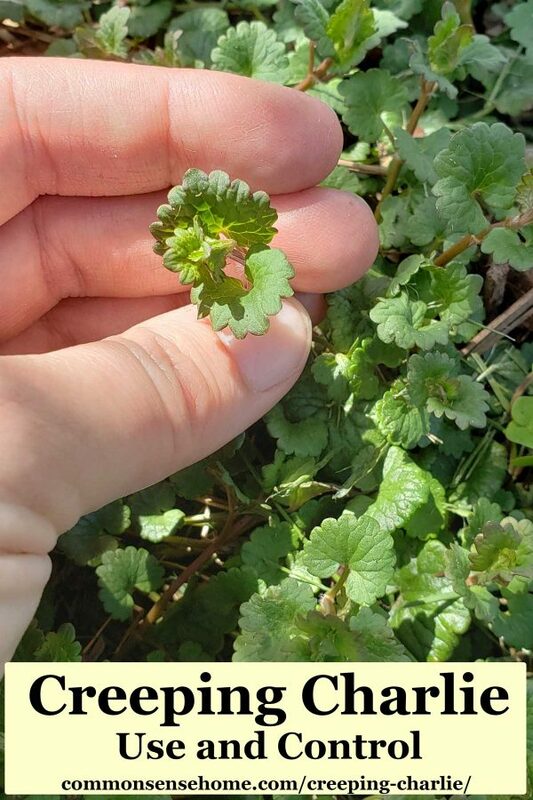 According to the “lawn guys” who leave lists of the weeds in my lawn in my screen door, I have Henbit which looks a lot like this plant and is also edible. Yes a great big YES! I truly am THRILLED TO JOIN this site! THANK YOU SO MUCH FOR TEACHING US THE VALUES OF PLANTS! How to heal oneself without costly medications and all the side effects! I love your enthusiasm, Colette. 🙂 Since I starting learning about plants, every walk outside has me looking around with new eyes. I want to learn all I can about the herbs and their uses so that I can live a healthier life, and maybe help my mom with her osti. how ever you spell it. But I have been fascinated with herbs but didn’t realize that their is more than what I am use to seeing. like everyone else I thought the weeds in my yard where just that. Well last week I tried my first chickweed grilled sandwich and it was totally awesome, yummy. Yeah! Here’s to learning about new things and adventurous eating! Vitamin C does not interfere with Warfarin. Vitamin K does. It is possible that creeping charlie is high in vitamin K since it is a leafy green. But I would verify that before publishing. Please be careful when putting medical info on the internet. I really enjoy reading all your insight on plants. I never knew what creeping Charlie was but it does grow in my lawn as well. Please keep sharing these wonderful blog posts! Glad you enjoy them, Char. I’m going to work on some updates and new info this growing season. To make a basic tincture, finely chop clean dry plant material (enough to loosely fill your jar of choice), and cover with alcohol (I use 40 proof vodka). Stir to remove air pockets. Cover and let steep for 4-6 weeks, stirring occasionally. As for dosage, that’s tougher to nail down, because it’s nearly impossible to tell exactly how much of an active ingredient is in a homemade tincture. Typical tincture usage is 5-10 drops in water, several times per day. They look very similar, as noted in the post, but this is creeping charlie, Glechoma hederacea, not henbit, Lamium amplexicaule.